Amaretto was first a cookie made by the Lazzaroni family. According to legend, in 1718 the Cardinal of Milan was visiting the town of Saronno. In honor of his visit, Giuseppe and Osolina Lazzaroni baked a mixture of sugar apricot kernels and egg whites and created a new cookie named “Amaretti di Saronno”. In 1846 one of the brothers, Paolo, started a new company – Paolo Lazzaroni & Figli – dedicated to the production of liqueurs and food specialty items such as chocolates. In the meantime, the Lazzaroni cookie company expanded its range of cookies to include – the hard crunchy Amaretti; the soft cookie and a new liquid Amaretto cookie. To accomplish this, they developed a new recipe, which starts with the crushing and refining of the Amaretti di Sarrono cookies, then infusing the cookie powder into alcohol for six months. Today, this liqueur is known as Amaretto Lazzaroni 1851. Since its origin, it was marketed as a liquid cookie rather than a liqueur. Today, Amaretto Lazzaroni 1851 is still made according to original recipe and is the only liqueur made from the infusion of the famous Amaretti di Saronno cookie. The cookie company grew and became known as one of the most famous around the world for its high quality products. The cookie division was sold in 1984 to an American company– Campbell’s Soup Company. 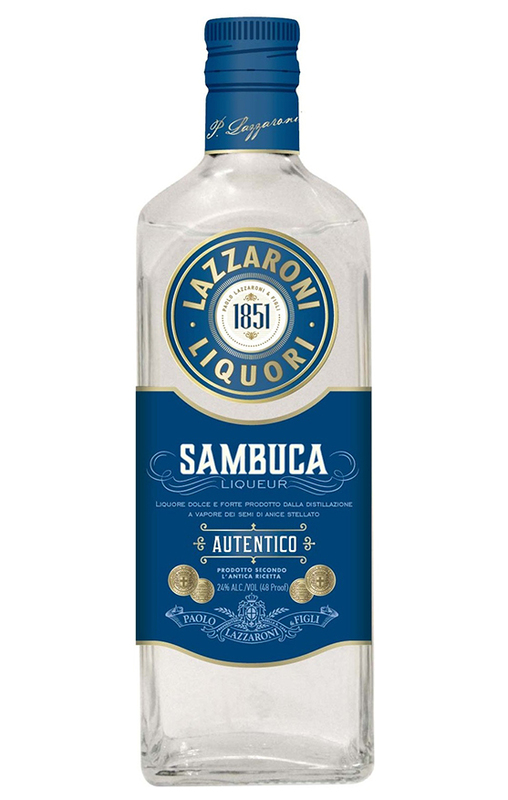 In the early 1990’s, Paolo Lazzaroni, named after his great-grandfather, built in Saronno a new plant for the production of the Amaretto Lazzaroni 1851 and other cordials such as Sambuca. In February 2004 the Amaretti di Saronno cookies were repurchased and returned to the Lazzaroni family. Today the Lazzaroni family is considered the Amaretto specialists. The Authentic Italian Amaretto since 1851, is still produced and bottled in Saronno, Italy, according to an old and unique formula: the infusion of the famous cookies “Amaretti di Saronno” in alcohol. This premium product with a rich Italian heritage has a almond/apricot flavor. Drink Lazzaroni Amaretto on the rocks, in mixed drinks or coffee, and even on ice cream. The Beverage Testing Institute (BTI) in Chicago declared Lazzaroni Amaretto, one of the finest liqueurs from Italy, scoring 93 points out of 100. It was considered “Exceptional” by the BTI’s tasting panel. Available in 750 ML and 1 L.
This Italian liqueur is produced from fresh peels of the finest lemons in Italy with no added colorants. These lemons are selected for their well-balanced flavor. All-natural Lazzaroni Limoncello is made from a recipe that goes back generations. 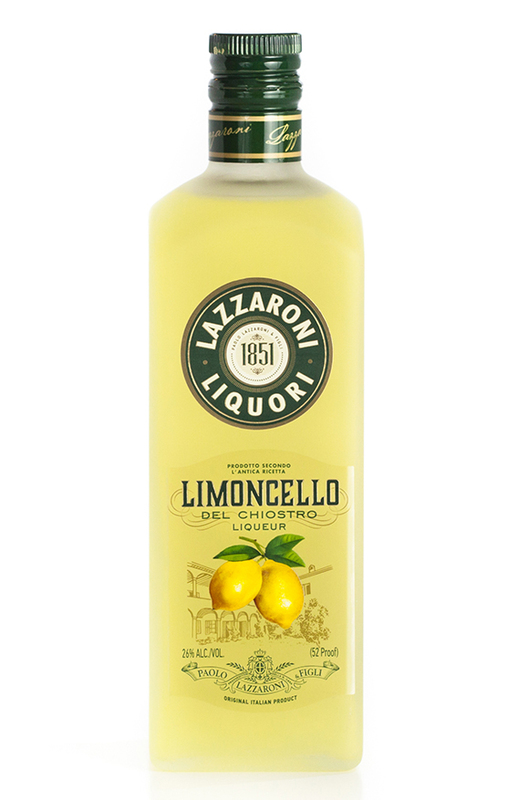 The Beverage Testing Institute (BTI) in Chicago declared Lazzaroni Limoncello , as a “sensationally vibrant and pure Limoncello”, scoring 91 points out of 100. 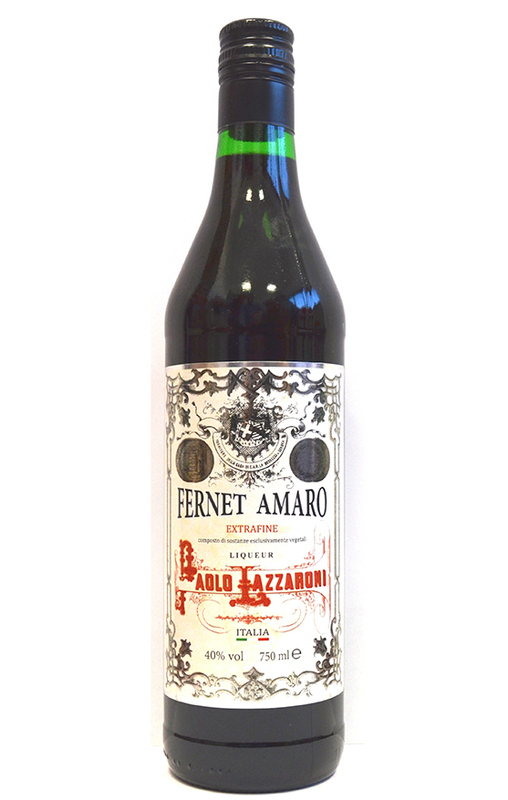 This liqueur is one of the oldest liqueurs produced by Lazzaroni. In the company’s archives recipes and labels date back to 1860. The product has been sold thru the years not only as a liqueur but also as an ingredient in the food industry. This clear and relatively dry liqueur is made from Marasca cherries, including the crushed pits which give the liqueur a subtle bitter almond flavor. The Marasca cherry is a small cherry that is dark with a bitter taste and dry pulp. 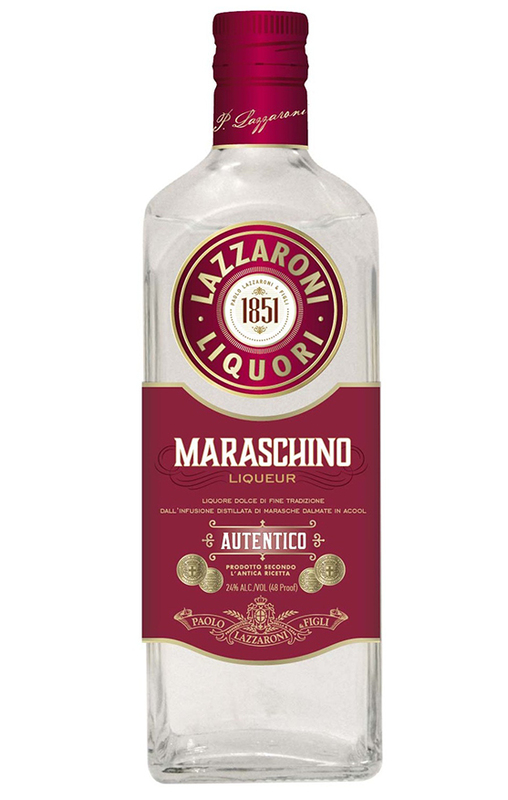 The Beverage Testing Institute (BTI) in Chicago declared Lazzaroni Maraschino, as a “delicious and elegant fruit liqueur”, scoring 97 points out of 100. It was considered “Superlative” by the BTI’s tasting panel. 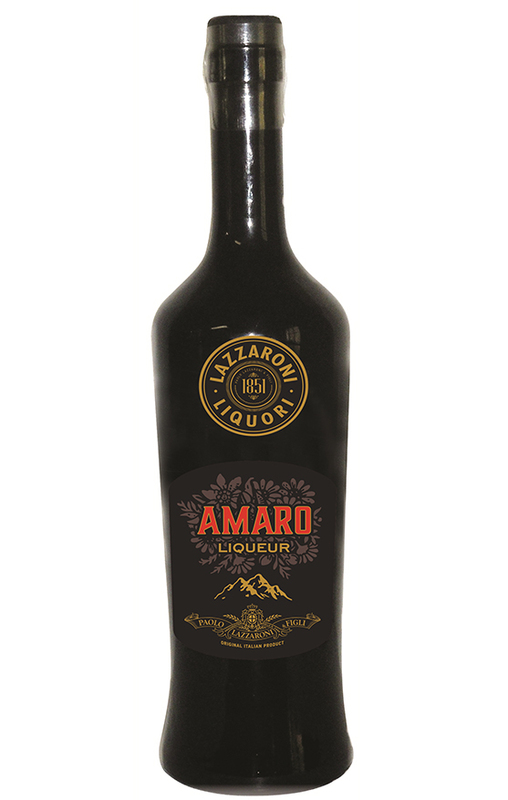 Lazzaroni Amaro is a delicious natural liqueur made with the infusion of traditional herbs, roots and berries from the Alps. This is a strong bitter liqueur made by the prolonged infusion of many different herbs and spices. 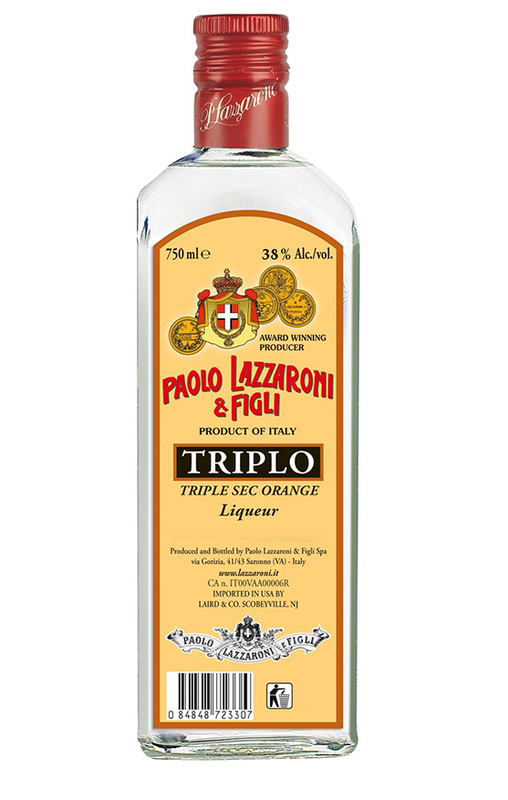 Triplo is a strong, sweet and colorless orange flavored liqueur. It is the sweetening/flavoring agent used in many popular cocktails. 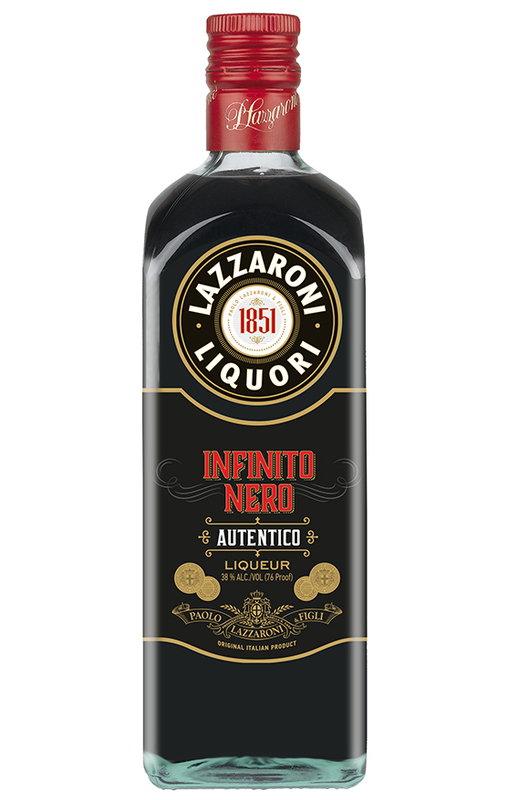 Lazzaroni Infinito is a black Italian liqueur based on Sambuca, created through the infusion of green anise seed with various spices. It is purplish black in color an aroma of anise. 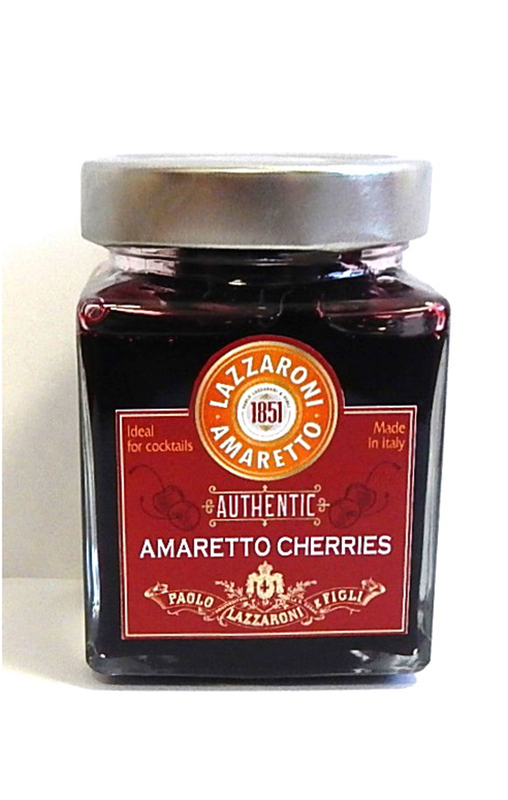 These gourmet cherries from the Apulia Region in Italy are flavored with Lazzaroni Amaretto. These ruby red candied cherries are a great addition to your favorite cocktails. Each whole pitted cherry has a sweet-tart flavor that will enhance any Manhattan. It also tastes great when spooned on ice cream!